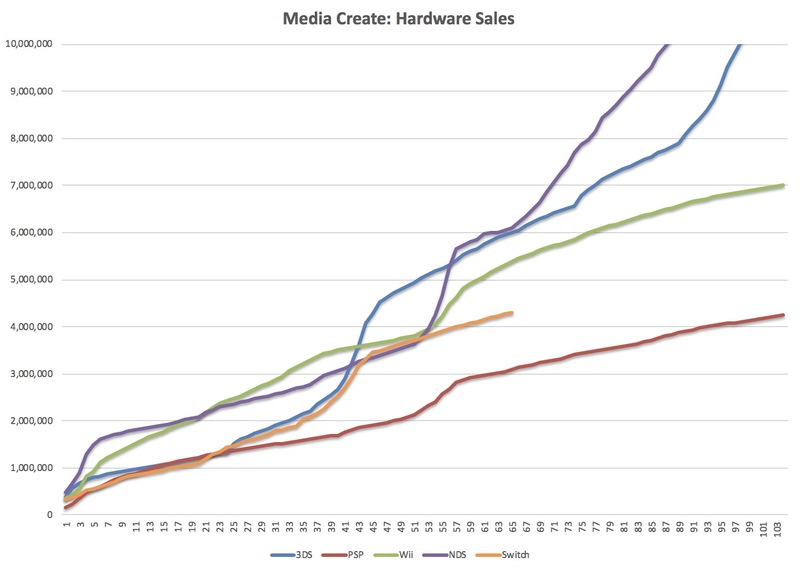 3DS and PS4 have basically reached their limits. I can't see them selling any impressive numbers at this point, even during the holidays. 3DS already hit 24 million lol. And Nintendo literally had put all the plug from supporting 3DS there. I don't see how far it can there. PS4 on the other hand is not a popular item in JP. it already had literally 3 biggest IP in Japan, DQ,FF and MH pushing the platform. And 10 million still seems very far far away. Persona 4 Dancing did 100k first week and it was a Vita exclusive. 65k isn’t a bad number for a multi platform game to sell. But I do wonder if it could break 90k with a Switch version. Nice numbers for Switch! Is the next 3-4 weeks the slowest of the year? PS4 summer might be worse than expected. If it didn't cross 20k this week it won't have many other chances. Zelda finally reaching 1M next week, still amazing to see it having those legs. Can anybody share Heavy Rain and Beyond First Week Numbers in Japan? I don't think there's any game now that could raise the baseline of the PS4. Another price cut will be coming this year, no doubt. Is Hyrule Warriors out in Japan? SWITCH IS RISING AGAIN!!!! I'M SOOOO HAPPY!!! Detroit may well double the LTD of both Heavy Rain and Beyond: Two Souls, which sold between 40k and 50k each (total). Just goes to show a better cover on your game box can go a long way, am I right? It seems a little odd that the Vita compilation and the PS4 compilation have different names; I assume the "Plus" in the Vita one is representing the inclusion of the (in the case of the Vita) already-released P4:DAN? Holy moly that's a mouthful. Someone release a new Action 52 to see if that can crash their database! Get the bunting out for next week, folks. Damn, P3/P5 Dancing kinda flopped, didn't they? Are folks not all that big on non-RPG spinoffs of the series anymore? Just one more week for Zelda and we can rejoice. 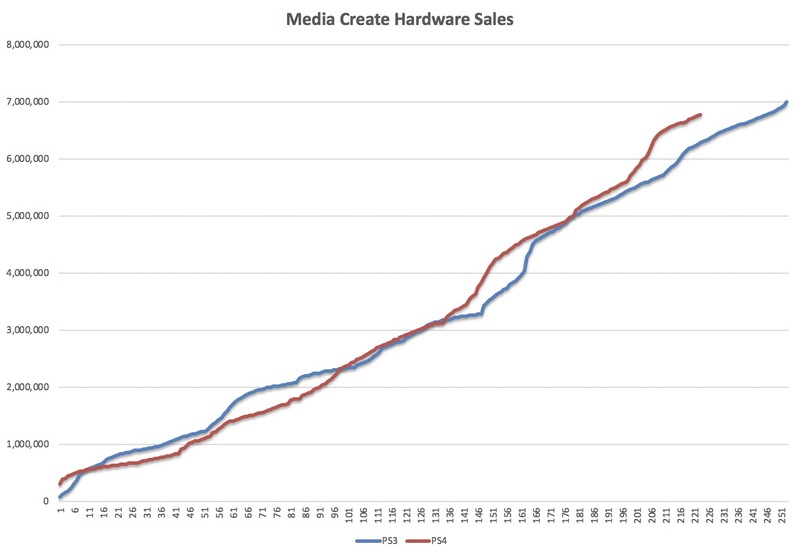 PS4 took the top 3 spots and hardware hardly affected. Splatoon and Kirby up WoW, nice. Ouch PS4. I didn't expect it to beat the Switch this week but I expected it to get close with all those releases. Now it doesn't look likely that it will beat the Switch any week this year barring a price drop or Kingdom Hearts 3. I like my Switch plenty but competition is very important and I want to PS4 to do well. I don't want every Japanese 3rd party to chase the Western market exclusively. Predictions for Dark Souls Remastered Switch first week? 20K. Dark Souls is a PS IP in Japan and I don't think the fans want it portable. Releasing later killed thousands of possible sales, imo. At this rate yeah it’s hard to imagine PS4 reaching 10m in Japan, especially if PS5 is coming out in 2 years. Not that Sony cares so much as long as PS4 keeps selling everywhere else. I agree. They probably don't care much at all. Still bitter about Dark Souls being delayed on Switch... that would've been a fun comparison (plus I could be playing it right now). Anyway, BotW at 1M physical next week. 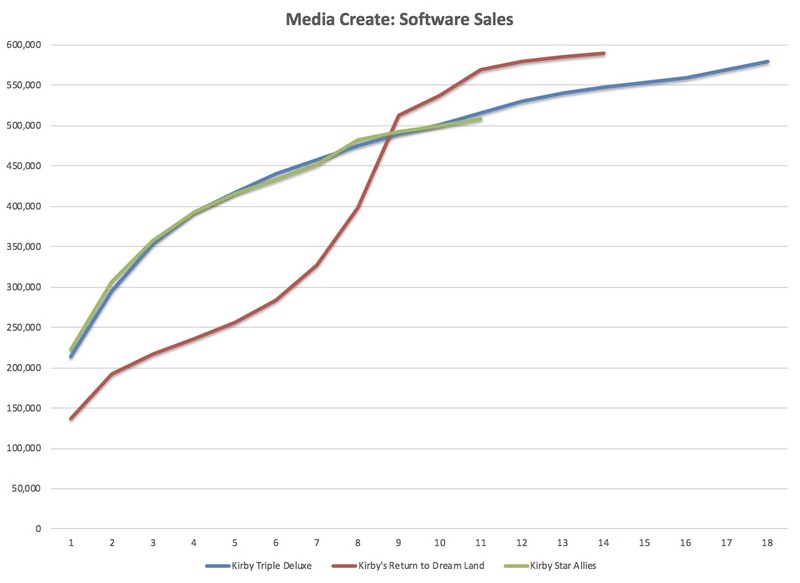 Next milestone will be combined sales surpassing OoT, right? That should be happening very soon. Seems like a pretty nice week for ps4 software. What was Heavy rain and beyond in Japan? Yup I did as well. These next 3-4 weeks are the slowest period of the year and its actually going up. I'm in exactly the same boat, last week I expected sub 30k and this week I expected sub 30k yet again, because of Summer and no new releases. Happy I was wrong. Is that Persona Dancing result healthy? It seems to have underperformed. Also, remember when there were people insisting that Switch would not outsell PS4 in Japan? Just noticed that combined Persona number is below 70k.....while Persona 4Dancing on VITA did 100k......... that Sega IP decline virus lol. Atlus better try to reinvent themselves more there lol. As P5 does not seems to had the same pull like P4 did. Interested in how Yokai Watch turns out. 4 is announced this year and will likely face direct competition with Let’s Go. Thankfully it’s skewing older which might differentiate it a bit. Still no screenshots or video though, right? Could work out well if its a December release. Seems good for Detroit. See how it does in week 2 then. Finally some new games! Will look more closely to the numbers later. I think 3DS has one more impressive holiday left in it. It’s a good thing the PS4 has not needed Japan much this generation because the hardware numbers are pretty bad. Sony would hope that they are able to find another MH phenomena for PS4 HW number in JP there. I wonder if we'd see a G version, because my gut says that that really ought to be handled as DLC on a platform such as the PS4... but it's Capcom, so who knows quite what they've got up their sleeves. I think it underperformed considerably. 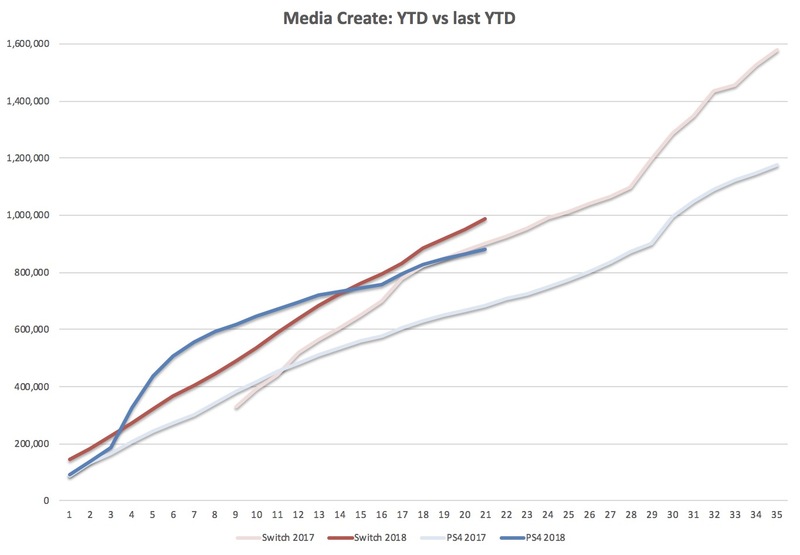 The Vita consumer base is much higher now than when P4 Dancing released. Not to mention the now added PS4 consumer base. I think combined skus should've been 150k minimum. Yep, it's already ridiculous as it is and then you factor in how much dlc both games have to see just how awful this whole release is. A real shame because even with it's flaws I still enjoyed my time with P4D, this one I'm in no rush to get. PS4 needs a price cut. I think a September Price should be incoming. that Sega IP decline virus lol. Atlus better try to reinvent themselves more there lol. As P5 does not seems to had the same pull like P4 did. The games have less content value than P4D, no story mode (which is significant for the fans who want more of that kind of content), and the novelty aspect of a Persona rhythm game is gone. This is not an indication of Persona 5's IP potential. I am not sure how everyone feels like Cac won't release G version there. They made Ultimate Marvel vs Cacpcom without care. They will do G version if that will make them money lol. Still P5 is much newer. It should still had that newly fresh title pull. But it does not. It will be interesting to see how far can P5 IP carry Atlus here as P4 is totally a gigantic golden goose for them for such a long time. Don't think so myself. According to insiders (Benji and Aquamarine), 3ds sales are almost exclusively driven by major software, and 3ds isn't getting any of that this year (last year it got pushed by USUM). Combine that with a general decline outside the holidays, and I feel like 3ds will be very low during the holidays as well. Persona 4 Dancing All Night had the superior opening theme. That's why it sold more. Vita userbase is also kinda dead. But even then, the performance doesn't strike me as very good.